We had a fantastic week. We did a couple of fun field trips and continued working on our Thanksgiving unit. I noticed many homeschool friends are taking off next week for the Thanksgiving holiday and honestly I haven't even really given much thought to taking breaks throughout the year. Because my kids only do a couple hours of "school" each day and almost everything they do is a learning experience we will most likely be homeschooling a little everyday except Thursday and I will have a week in the life of homeschoolers post next week. So here is our week in the life of homeschoolers update week 16! Monday: It was speech class as usual follow by some library fun. We spent about 2 hrs at the library reading lots of books and joining in on storytime. Here are a few of the books we read. 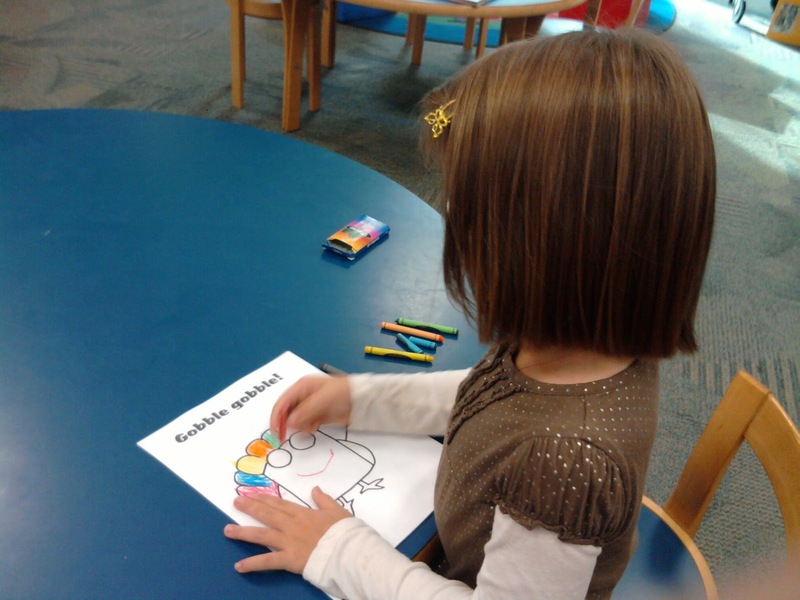 Gwyn coloring her Turkey which was posted on the library wall. Some more books we read. Tuesday: We worked on our Thanksgiving unit. Making a Thanksgiving mini book. Turkey color by number one of Gwyns favorite things to do. Finding the same size objects. Pom Pom Turkey and fist time using a low temp glue gun. Wow if I would have know that static clings would keep them busy for over 20 min I would have gotten some a long time ago. Decorating piggy banks (or ticket banks in the kids case). Finished ticket banks. I love how they decided to put wings on them. I told the kids about the saying, "when pigs fly." Gwyn laughed hysterically and said mommy pigs don't fly. Wednesday: We had a field trip at Stevie B's pizza. Originally the field trip was supposed to be at Cici's pizza (did you know they have a whole pizza curriculum set up for field trips) but their restaurant had a water main break so we had to make alternate arrangements. A few of us decided (that didn't want to disappoint the kids) decided to go to another pizza restaurant up the road. The kids didn't get the tour or make their own pizzas but they still had fun with their friends playing games and eating pizza. Skee ball, but most of the time the balls were flying across the room. The kids watching 500 tickets come out. Their one friend hit the JACKPOT! Homeschool lesson adding and subtracting to figure out what goodies you can get. Gwyn learned that just because its a buffet it doesn't mean you should just keep eating. The girl had 4 pieces of pizza a bread stick and ice cream. She wanted more but I cut her off because I told her she would get a belly ache. Thursday: We worked more on our Thanksgiving unit. By the time next Thursday comes around I may be so sick of seeing Turkeys I may not be able to actually eat any, lol. Putting the Thanksgiving story in chronological order. I was so proud of Gwyn she read the colors all on her own!!!! My son still writing/drawing with both hands. See what I mean another Turkey craft and there will be more next week. 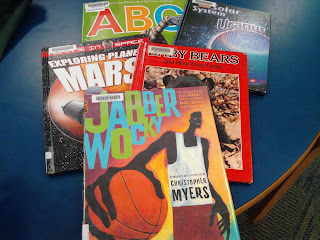 Friday: Gwyn attended her first science class at the library. It was a 2 hr class where she learned all about pulleys, leverage and more (the best thing is that the science class is FREE). While Gwyn was in class I took advantage of the time to work 1 on 1 with Rowyn on his A,B,C recognition and writing. Later a friend met us and her little one played with Rowyn. After class was over we went to a local pizza shop for lunch. Putting together a puzzle and going over 1,2,3's. Mommy, "can we write letters." mommy, "sure." He wrote a couple then says, "mommy I don't want to do this anymore." Another one of Gwyns shots. Saturday: Yup homeschooling on Saturday again. We went to Michaels and made gift bags and then we went to Barnes and Nobles for storytime (again both FREE or mostly free events - the Michaels craft cost us $1). When we got to Barnes and Nobles though we were surprised to see LOTS of little kids running around and the storytime area packed. 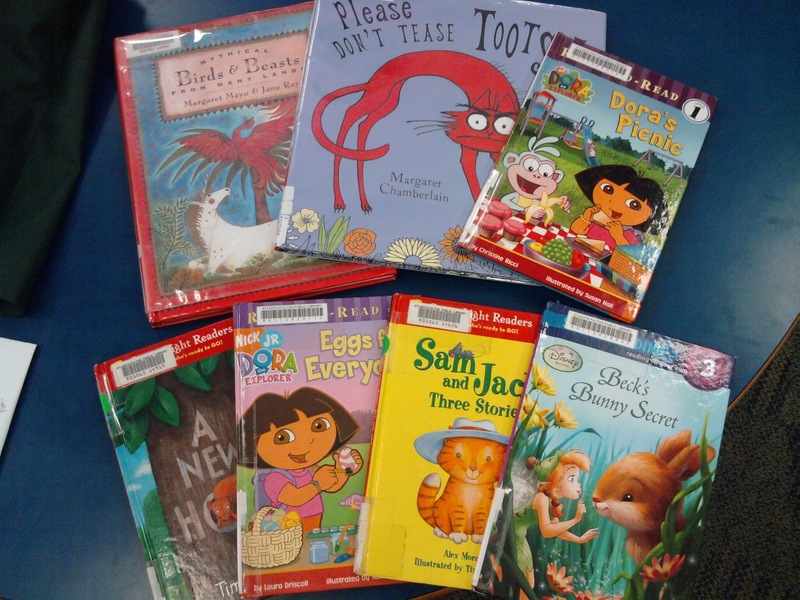 We then realized that there was an early education school doing a book fair fundraiser. There were kids singing, storytime, face painting and temporary tattoos. So we decided to hang out and the kids had a great time watching the other kids singing and they got multiple storytimes. Making gift bags at Michaels. fun week! We only do an couple hours of school a day too, but still take breaks mostly for me and planning...but really the days we don't have school the kids drive me insane b/c they aren't 'busy' doing something. So those weeks we try to get out of the house as much as possible. We aren't really taking 'off' next week though...b/c we will have a lot of time off in DECEMBER. But I'm with you they are ALWAYS learning. Thanks for linking up with Workbox Wednesday and Brag Time Thursday...looks like you had a great week! I don't really take breaks...we just go light (cuz they drive me crazy if they off schedule). I am also going light on my posts and hops as part of our light schedule! loving all these photos - what a great week! !